Pad and Quill today announced a new line of accessories for the upcoming Apple Watch, including the "Luxury Pocket Stand" charging stand, a roll up pouch for portability and two travel kits. 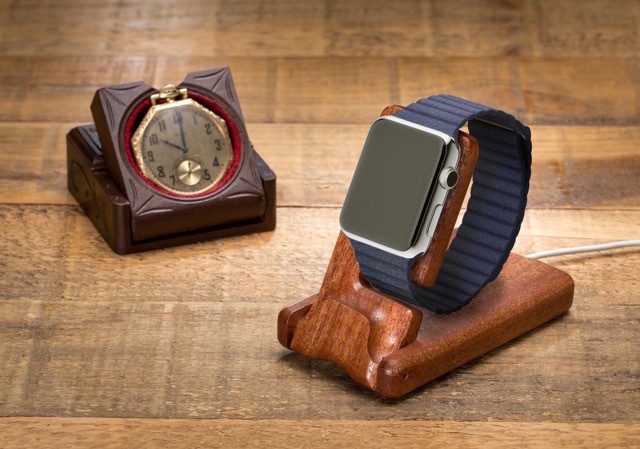 The Luxury Pocket Stand is inspired by old pocket watch stands and is hand carved from a single piece of African mahogany or American cherry. The stand is also collapsible, allowing users to fold it up and take it with them on-the-go. The Roll Up Kit is crafted with full grain American steer leather for packing on the fly and comes with a pouch to hold the charging magnet. There's also the Luxury Travel Kit and Luxury Travel Pouch, both of which come with the Pocket Stand and space for chargers. The Travel Kit, however, features secondary sleeves to hold Apple Watch bands. The Luxury Pocket Stand is available for the pre-order price of $69.99, but will raise to $79.99 when it's released in May. Both the Luxury Travel Kit and Travel Pouch are available for pre-order priced at $119.99, while the Roll Up Kit is available for pre-order priced at $49.99. All four products ship in mid-May. I know, let's use Apple watch prices as a guide for our crappy products. Judging by the comments here this will be Tim Cook's defining failure as CEO. If this thing is so despised among Mac (note I said Mac and not Apple) fans and technology enthusiasts it's going to make Apple a laughing stock. You obviously weren't here when the iPad, iPhone and iPod got announced. Same old story this time. That looks like moulded poop. Utterly disgusting, sorry. I'd go with Twelve South or DodoCase. It looks like rubber dog **** flown out of Hong Kong. Just buy a pack of Lego and build your own. Well, an ugly accessory, for an ugly device. Negative, the pattern is full.